I knew something was there, I just didn’t know what. The topographic maps hinted at a secret gorge with waterfalls, miles from any road. Did SGL 57 have another secret up it sleeve? After seeing so many of its waterfalls, gorges, big rocks, pristine streams, and diverse habitats, it was hard to think there could still be something hidden deep in the thousands of acres of forests. How could a place this beautiful, this diverse, be relatively unknown for so long? Our plan was ambitious. 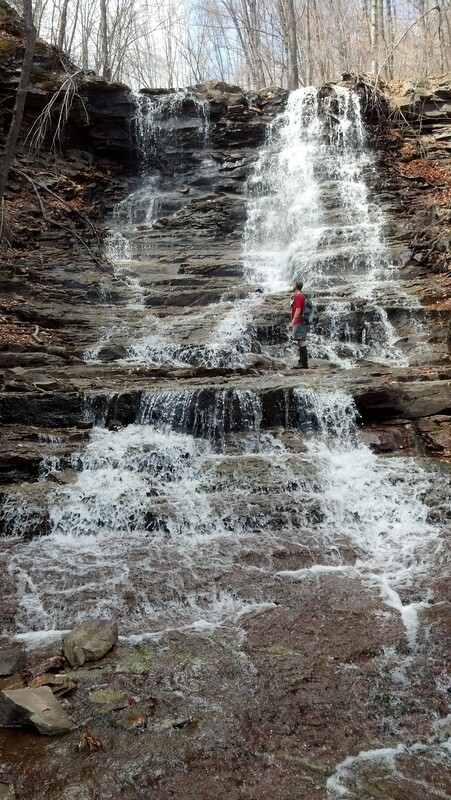 We would bushwhack from Becker Brook southwest along cliffs and ledges, proceed down to Mehoopany Creek, and then climb up the hidden waterfall gorge. From there, we would have to find some way out to the road. While I expected rough terrain and thick brush, I did not expect to see a place so beautiful. Ryan and I left the game commission parking area above Becker Brook, battling thick mountain laurel above a rim of cliffs. The brook roared below us, announcing the presence of cascades. We scrambled down a fractured cliff to reach the one branch of Becker Brook. It was a steep ravine filled with boulders and a creek with non-stop cascades and rapids. The sun was blistering with its light, even in the morning. The day promised to be a hot one. Our route descended along a branch of Becker Brook, with damage from the floods still evident. Sides of the ravine were torn out with collapsed trees and landslides. We soon reached the other, and larger, branch of Becker Brook and began our climb up. This branch was even more scenic with higher cascades and deep pools framed by large, smooth boulders. The setting was truly scenic, and we weren’t even at the best part. We reached a private property line and turned away from the brook. A climb followed up to a series of ledges and cliffs. Moss and fern covered boulders hid deep caves and crevices as springs dripped in secret. Ice and snow still remained in the shadows. The footing was difficult as I negotiated the terrain. A spring cascaded down a carpet of moss like a bathroom shower. As we proceeded around the rim, the cliffs became larger, featuring massive overhangs and deep grottos that held even more ice. The rim soon revealed a long cliff from which countless springs tumbled down. Rounded columns of ice and snow were under the cliffs. It was a beautiful place that we called the “Weeping Wall”. In winter, the ice flows here would rival the more famous ones at Kasson Falls. The rim wasn’t done. We fought through beech saplings as the sharp twigs stabbed and cut my legs. 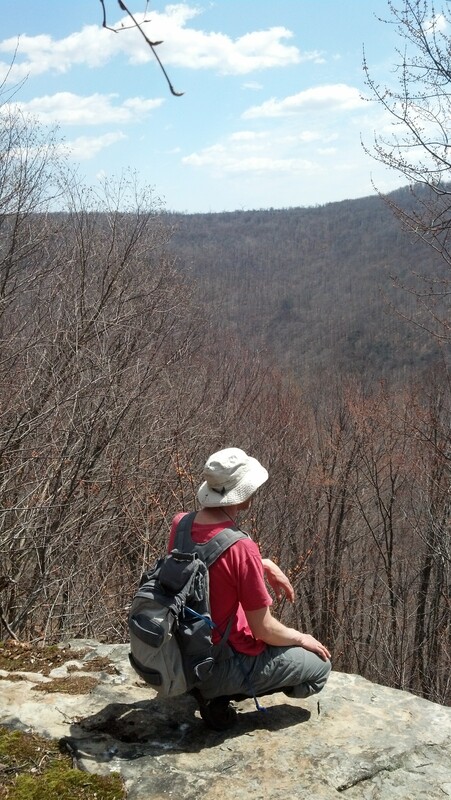 The cliffs rose higher and we reached a couple of nice views of the Upper Mehoopany Creek canyon. One view even looked down the canyon towards Forkston. I wish we could have spent more time at the views, but we didn’t know how difficult the rest of the hike would be, so we pushed on. I was beginning to feel very tired and sluggish. I had little energy as the sunlight burned through the bare trees. I didn’t know why I felt weak. I wasn’t that hungry and I still had water, which I made sure to drink. Our route took us into a valley or drainage where we passed a couple small springs. I walked on top of a large ledge and looked down. There I saw something that almost seemed Biblical- a spring pouring from solid rock. I had to look twice to make sure I saw it right. There it was, a pure spring gushing from a crack in the rock. Ryan and I scrambled down. We just stared at it. Ryan put his ear to the ledge; he could hear the water flowing through it. I decided to drink from it, and quickly filled up my bottle and reservoir. The water wasn’t simply cold, it was chilled. And it was the most delicious water I ever tasted. We both sat there, drinking to our hearts’ content. The smallest thing became the most surprising. I immediately began to feel better as my strength returned. We called it “Blessing Spring”. We didn’t want to leave. Eventually, we did. We were refreshed and invigorated. 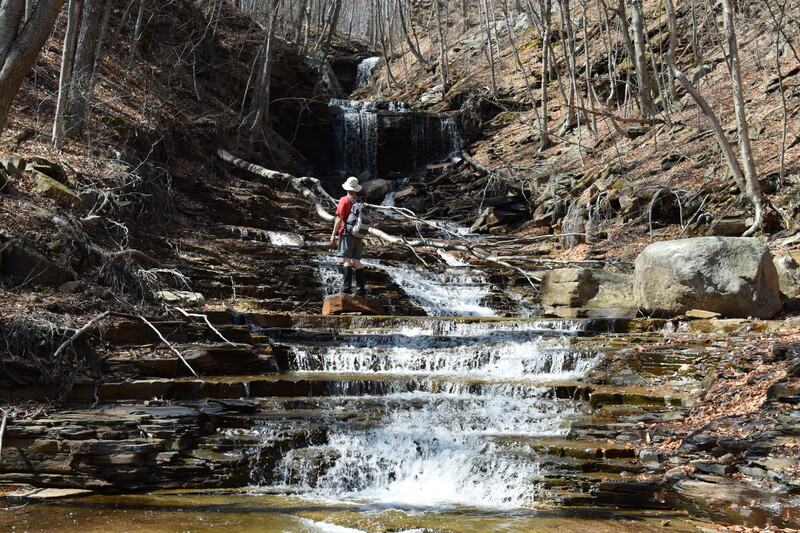 A long, steep descent to Mehoopany Creek followed as rapids glistened in the sun. We hiked upstream and took a break along the water in the bright sun. Our hike continued along the valley into an area which appeared to have subsided from the floods; a distinct fault marked the place where the land subsided. Surprisingly, the forest remained unaffected. We reached the unnamed creek and passed a campsite with old cookware. The bottom of the gorge was covered with fallen trees and flood erosion. A ten foot falls soon greeted us. Large boulders littered the creek as we scrambled. Ahead was a long waterslide and an impressive grotto with a stunning falls about 40 feet in height. A difficult scramble around the highest falls revealed more waterslides and pools. The gorge was precipitous with steep slopes, making it difficult to crawl out. We looked up to see a stunning sight- three waterfalls descending the gorge. We were able to crawl behind the second falls as a curtain of water got us wet. Another tough scramble followed where we reached a beautiful grotto at the top of the gorge. There was another falls where we were able to crawl behind. We sat at the top of the gorge and looked down with its large boulders and bedrock slides. Fractured cliffs framed the gorge. We were amazed by the scenery. If this gorge was close to a road, it would be a state park. We explored another ledge and then made our way out to the road through forests with ground pine and blueberry bushes. A road walk followed back to the car, bringing an end to another epic journey in SGL 57. We travel the world to see places we’ve never been, when such places exist in our own backyards. Photos and videos of the hike. Location of the Waterfall Gorge. Jay Lewis running Haystacks Rapids. Photo by Steve Graley. 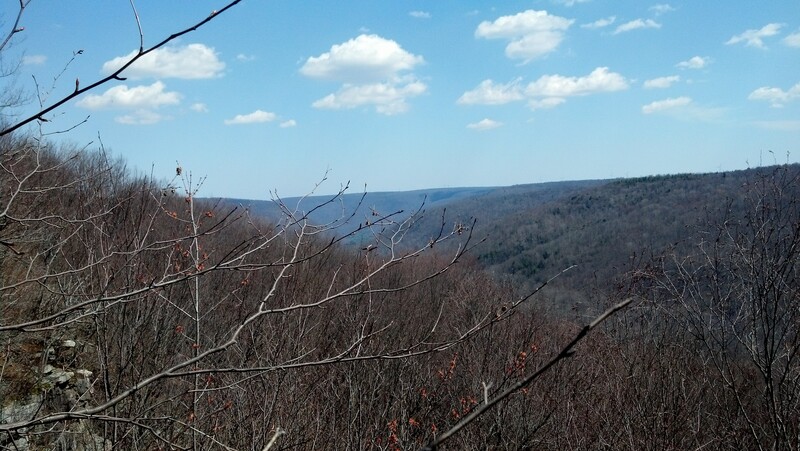 The Loyalsock is a trail and a state forest, both known for their scenic beauty. Before either of these, it was the name of a creek that flowed through a deepening gorge with rapids and side stream waterfalls. A few weeks ago, a couple friends and I met to kayak the creek from US 220 to Worlds End State Park. The weather was incredibly sunny with a deep blue sky. We felt the warmth of spring. 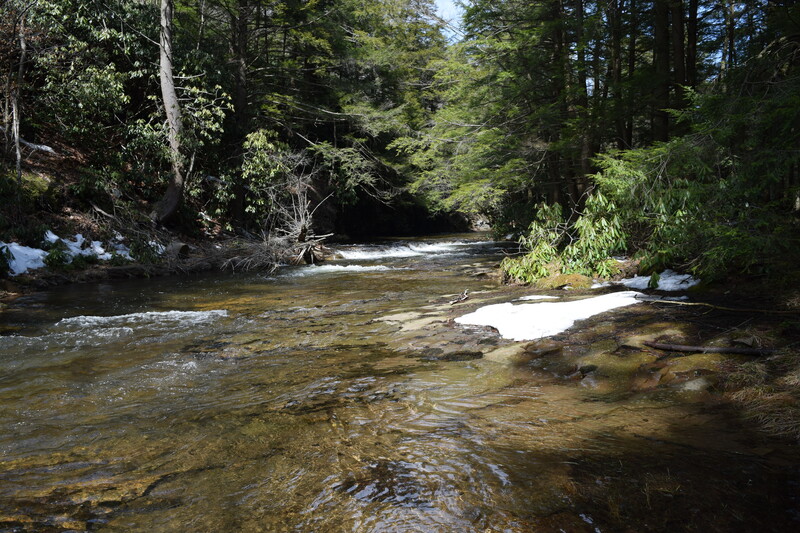 However, the Loyalsock is known for its clear, frigid water, which reminded us winter was not that long ago. The level was about 4 feet on the USGS gauge. We paddled over some ledge rapids below US 220 that had surf waves. Soon Dutchman Falls appeared on the left as the creek burrowed through hemlock forests. The bouncy rapids grew more significant with longer wave trains. More side streams cascaded into the creek as we floated over deep clear pools. The famous Haystacks soon appeared and we got out of our boats to scout. Everyone ran the rapid successfully. The Haystack are always a little intimidating from the water. A maze of boulders appeared before me and the current through them is very tricky with boils and crazy currents. I tried to paddle into an eddy, but the current deflected me, I was about to go over the drop backwards until I paddled furiously to get into the eddy. I turned around and attempted a diagonal line over the drop. However, I clipped the hole at the bottom of the drop and flipped over. Thankfully, a roll saved me from having to swim in the freezing water. The powerful water roared between the rounded boulders. More fun rapids awaited us downstream, but the creek mellowed out as we reached a bridge, where we got out to eat. I drained my boat and was surprised to see how much water it had. As we relaxed in the sun, a large group of backpackers hiking the Loyalsock Trail passed above us on the bridge. We waved. Everyone loves the Loyalsock. After returning to the water, we passed a cliff with cascading springs and towering ice columns. We soon reached the beginning of S-Bend Rapid. Here, the creek is incredibly beautiful as slanted cliffs loom over a swirling pool with a small beach on the opposite shore. Ahead, the creek flowed along the base of a cliff that rose over 200 feet. S-Bend Rapid has changed from the floods, making it an even more fun, and challenging rapid. A powerful slide shot me into a wave as I paddled to reach a pool. Below there was a steep boulder rapid with large waves and a hole that could flip a kayak. Massive boulders littered the shore, tossed into place by the floods. I began in the center of the rapid and gradually moved right, punching through the big waves as I paddled between two boulders. Looking upstream, to see the whitewater rapid and the massive cliffs, was a memorable sight. The fun wasn’t over. 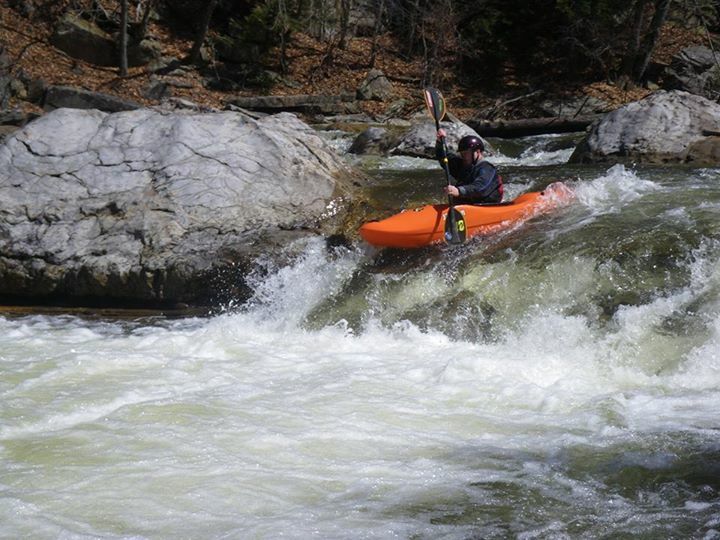 Another challenging rapid was just downstream where I nearly missed a tree that had fallen into the creek. My boat felt heavy and sluggish. As we entered Worlds End State Park, the rapids picked up, as did the scenery. This is such a beautiful state park. Multi-colored cliffs rose above us as springs tumbled into the creek. High Rock Falls roared above us as we paddled through waves. My boat was so heavy, a wave nearly made my boat stand on its end. I got out and looked into my boat, it had several gallons of water in it. It appeared the hull was cracked. We got changed in the state park as the steep mountains rose around us. The Loyalsock, whether it be the creek, state forest or trail, is such a special place. We are blessed to have it so close. The roar of the creek filled the gorge as the bright sun filled the azure sky. Days as perfect as this are few and far between. A video of the paddling trip down the creek, courtesy of Steve Graley. Why hasn’t anyone told me about this place before? 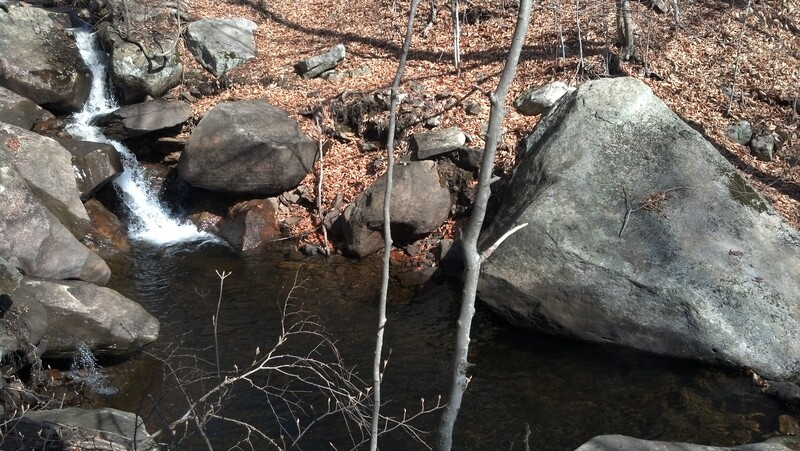 On a beautiful, warm, sunny Spring day I scoured my maps for a place to hike. I wanted someplace new. When my maps failed to reveal a destination, I turned to the trusty internet. My fingertips stumbled across this preserve, and I knew I found the place I was hoping to find. Ironically, I was here a few years ago, but at the separate Dry Land Hill Parcel. The hiking there wasn’t too exciting. I’m guessing the Shades Creek Parcel’s trails weren’t completed at the time. Both parcels make up the impressive Bear Creek Preserve, owned by the Natural Lands Trust. The preserve covers over 3,400 acres and was a generous gift from the Haas family. Thanks to them, this gem is open to the public and will preserve this gorgeous landscape for generations to come. What is even more impressive is that the Bear Creek Preserve is a part of a system of state forests, state game lands, state parks, conservation easements, and other preserves that protect over 150,000 acres! We reached the trailhead off of PA 115 and followed the red trail through a forest of hardwoods, laurel, and pine. Next was the grey trail that descended to Shades Creek and crossed it via a footbridge. The trail along the creek was beautiful as it tunneled through rhododendron jungles above the creek filled with rapids and pools. The trail crossed a side stream with its own waterfall and some giant old growth hemlock. Soon we reached another falls on a tributary across Shades Creek, nearly concealed by rhododendron. This place would be breathtaking when the rhododendron blooms in July. The forests were truly scenic and serene with a combination of hemlock, pine, laurel, and rhododendron. Carpets of moss covered wet areas. The trail dropped closer to the creek which reminded me of West Virginia’s famed Otter Creek. There were more rapids and pools over the bedrock. The creek tumbled over waterslides and entered a small gorge with a deep pool. Absolutely beautiful. The trail then entered a majestic forest with some old growth white pine. The grey trail became a little harder to follow with some infrequent blazes, but we found our way. The sublime scenery continued with more views of the creek. The trail returned to the rhododendrons along sloping bedrock rapids in the creek. The blazes stopped and the trail appeared to cross the creek, but it was too high for us. Just downstream was a powerful five foot falls into a deep pool. We retraced our steps. I was very impressed by this hike and I plan to return soon to explore the remaining trails. Right now, there are over 20 miles of trails, and more are planned. Some of the blazes were infrequent and crossing Shades Creek in high water would be dangerous. Trail junctures did not appear to have signs. This preserve is one you can’t miss. Be sure to put it on your hiking list. Another gem in Northeast PA.
Maps and information about the preserve. Sunday promised crystal clear skies and not-too-cold temperatures. Naturally, it was time to go hiking. I decided to check out the southern Loyalsock State Forest, where I haven’t spent much time. We parked off of Dunwoody Road with the goal to reach Falls Trail as indicated on the most recent Loyalsock State Forest map. We hiked up side-hill on the southern exposure of the mountain, where there was no snow. The sun was incredibly bright and I soon became too warm. We reached the top to encounter snow along a deep spruce forest. The trail passed old fields; the snow resonated with blistering sunlight. The trail descended to Hessler Branch. The scenery was superb. 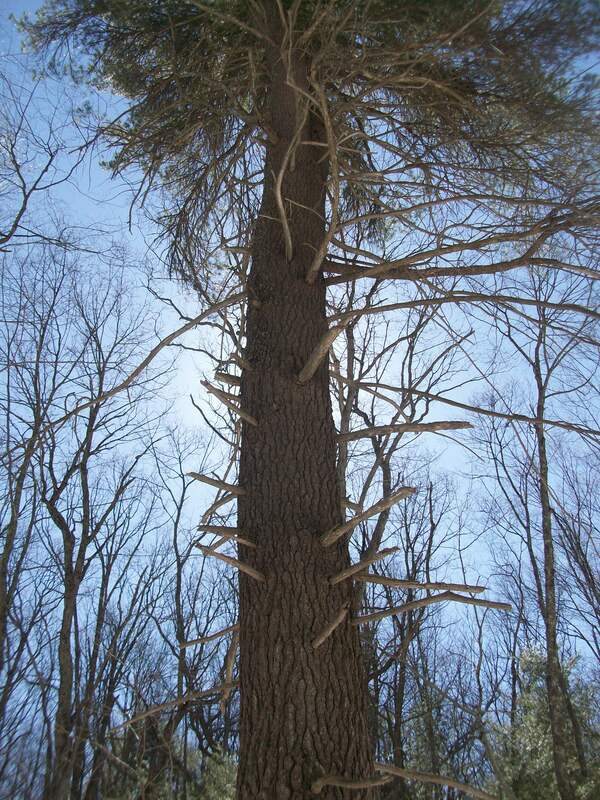 Deep hemlock forests covered the glen, with some large white pine. The hemlocks were healthy, deep and green. The clear stream babbled through the forest. We climbed out of the stream valley through mountain laurel and more pine. The snow became soft in the bright sun; our feet sunk into it. The descent to Grandad Run featured a deeper and darker hemlock forest and another pristine stream. A beautiful spot. A side trail descended the valley. The forests were gorgeous and diverse. In typical fashion, we hiked over another ridge with more laurel, and teaberry. The Loyalsock Trail turned left; the Little Grandad Run Trail went right. We proceeded straight over another rolling ridge followed by a steady descent. The trail passed a massive oak tree. 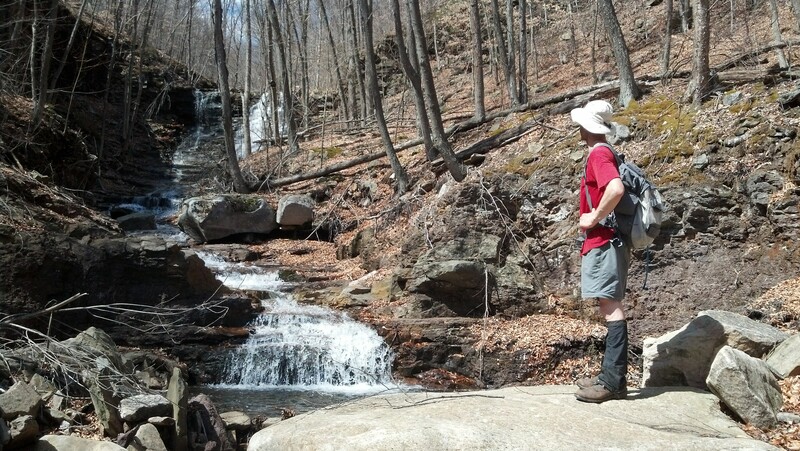 The trail turned right at the bottom of a small drainage, and proceeded down Falls Run; this was the Falls Trail. We took another break. The forest was still and serene as we warmed ourselves in the sunshine. While the ground was white, the forests were layers of green with laurel, pine, and hemlock. The Falls Trail was enjoyable as it descended a secluded glen with more hemlock and meandering bear tracks. The small creek had cascades and a nice campsite, but no waterfalls. We reached private property; maybe the supposed waterfalls were further down the creek. We hiked out to Dunwoody Road, passing a spring tumbling into a barrel, covered in moss. The road soon brought us back to the car, completing a nice hike in this corner of the state forest.